The Cypriot President has ruled out the incident has anything to do with terrorism, the government's press office said in a statement on Tuesday. 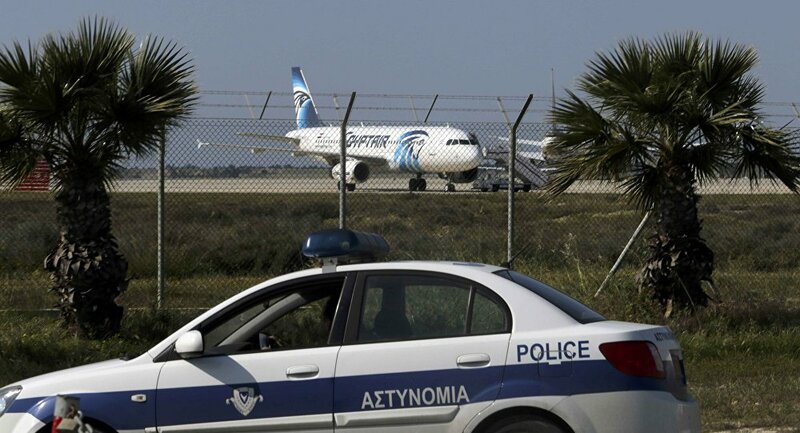 MOSCOW (Sputnik) — Cypriot President Nicos Anastasiades said the government is doing everything possible to ensure the safety of the hostages on board the hijacked EgyptAir commercial jet currently located on the ground in Larnaca. "On the sidelines of his meeting with the President of the European Parliament [Martin Schulz], and when asked to give a comment on the incident involving a hijacked plane in Larnaka, the President said that 'it seems that 49 passengers have been released. We are doing our utmost in order for everyone to be released and safe and to give an end to this unprecedented (incident). In any case it is not something which has to do with terrorism,'” the statement reads. An Egyptair passenger plane was hijacked by a man who was said to be wearing a suicide bomb vest Tuesday morning. The jet has landed at the airport in Larnaka, Cyprus, according to the country's state broadcaster. According to various reports, between 60 and 81 people were on board the hijacked airplane.